Caps on municipal traffic enforcement income have already been enacted in several states. Cities use traffic fine income to help balance their budgets. 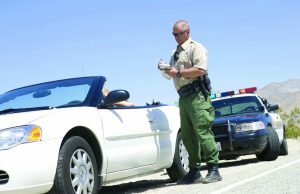 In some cases, this has led to state capping legislation — laws that govern the percentage of the the municipal income that can come from traffic citations. Typically, fines taken in over that amount go into a state fund. The law caps the amount of general revenue brought in by traffic tickets to 30 percent. Last year the legislature passed SB 264, preventing local police from using traffic ticket quotas. The move stemmed from a longstanding speed trap in the small Alachua County town of Waldo, along U.S. 301. The bill also requires local governments to submit reports to the legislature if traffic ticket revenues cover more than 33 percent of the cost of operating their law enforcement agencies. In 2015, SB 134 reduced the amount of traffic citation revenue as a percent of the municipal budget, from 40 to 35 percent. Last year Missouri enacted SB 5, partially connected to issues in Ferguson. The law limits the annual general operating revenue from traffic fines to 20 percent or 12.5 percent, depending on location. Under Oklahoma law, a city may not receive more than half its income from such fines. In Virginia, a 2012 budget formula limited traffic enforcement revenue; and a 2015 amendment further reduced the amount local governments could keep, said State Senator Bill Carrico of the 40th District. So Virginia did have a cap prior to the 2016 General Assembly session, but it was subsequently removed by Governor Terry McAuliffe. The Virginia Association of Counties, Virginia Municipal League and the Virginia Sheriffs’ Association all objected to the cap because it limited income for municipalities, according to retired State Trooper Bill Carrico. They lobbied the governor to strike it down. But citizens usually support such caps, calling the alternative “taxation by citation” or “policing for profit.” They prefer police spend time on other types of crime, rather than setting up “speed traps” or writing tickets for those who may be going over unusually low speed limits. The federal government has become involved. On March 9, 2015, Representative Emanuel Cleaver II (MO-05) announced a plan to introduce a bill to ban criminal and traffic law enforcement activities motivated by revenue-raising purposes. The Fair Justice Act would bar a municipality from exceeding 30 percent of its general revenue from traffic tickets and fines. Funds exceeding the 30 percent cap would go into a state fund for community policing efforts. The bill would require each state to pass its own law capping traffic fines at the same level within a year after enactment and would bar local law enforcement agencies from issuing directives that would allow the agency to issue tickets based on motivations of revenue rather than public safety. Additionally, it would effectively ban police from carrying out “taxation by citation.” Rep. Cleaver has not yet carried through on his promise to introduce the act. Another proposed bill would prohibit automated enforcement. Rep. Ed Perlmutter (D-CO) has introduced legislation that, if passed, would prohibit the use of automated cameras in traffic enforcement across the country. The bill is H.R. 950, the Prohibiting Automated Traffic Enforcement Act of 2015; it was introduced February of last year. There have been no hearings on the bill to date and it has only one cosponsor, Rep. Albio Sires (D-NJ). Additionally, the FAST Act, signed into law by the president in December, included language in the “Miscellaneous” section stating that funds apportioned to states cannot be used to purchase, operate or maintain an automated traffic enforcement system except in a school zone. Andrea Edmiston of the National Association of Police Organizations said the group picks up only on issues brought to it by member state and local law enforcement agencies. No member group has brought the issue of capping legislation to them. The NAPO board decided not to take a position on the Prohibiting Automated Traffic Enforcement Act of 2015. However, Herbert Brag, director of intergovernmental and public affairs for the city of Hopewell, Va., said police in his town were glad for their governor’s action on traffic enforcement revenue, and that the auditor of public accounts for the state has said there was no precedent for the state to take those funds. “This law had affected two miles of Hwy. 295 that goes through the city limits of Hopewell. The speed limit there is 70, and the sheriff department was policing that area and would only stop motorists going 80 and above. They also ticketed people for having drugs on board, for not using seat belts and for having illegal weapons. By being there, sheriffs have also been able to assist motorists who’ve broken down on that stretch,” he said.